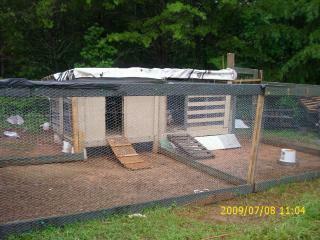 We have been building a chicken duplex out of old pallets that we are recycling. This whole coop is made out of recycled materials. The only purchases we have made is for chicken wire, screw, nails and hardware (latches, hinges, etc). 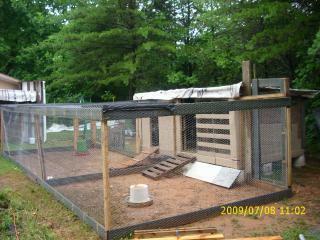 This is the side view of the run and the coop. 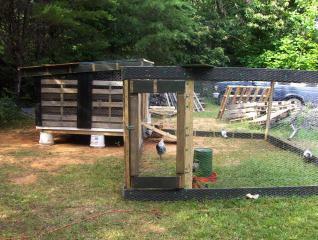 The coop is 8 feet wide by 12 feet long. This run is 12'x18' and the half of duplex is 8'x6'. this is the front of the coop, you can see the pallet on the right, it is covered with wire and left open for added ventilation. 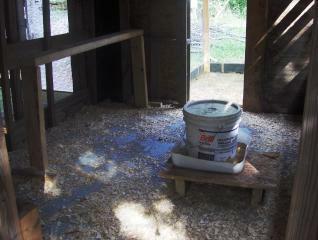 I will be finishing the right side for the turkeys and their black chicken buddies. Inside of the finished half of the duplex. 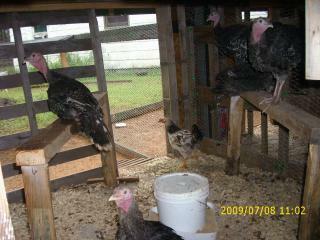 It is housing some americaunas and bantam booted chickens. 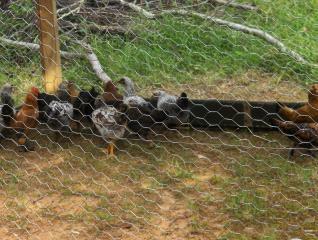 As you can see we make our own feeders for the chickens. 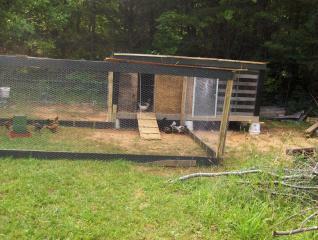 Here are some of the chickens in their new house. Sorry I didn't get pictures as we were building it. The floor is made out of 6 pallets set on 3 gallon buckets. We covered the pallets with some recycled plywood and then surrounded all of them with a 1x6 recycled deck board (those are painted green in all the pictures). The floor plywood was painted with recycled paint and then covered with vinyl asphalt tiles (given to me from a rebuild, they changed colours). I used long pallets for the two end walls and down the middle, stood a 4x4 pallet on end and attached it to the right hand side of front. Stood another one up and attached it to the middle pallet and then put a piece of plywood on the left had side of front. The back was made of one long pallet in the center and doors on each end made of recycled wood. We picked up a lot of used OSB board from where I work (they are remodeling the store) and used that for the roof. We are going to cover it with a recycled billboard sign (tarp) until I can afford some roofing materials. "Would like more details of build, etc"
Back when I was a wee bit younger, I built one of these. They are soo cheap and serve their purpose well. Very resourceful choice of materials! "Great re-use of building materials"
Can't get a clear picture of how it's laid out inside. Needs better explanation and more pics.